There is no change in the way Google Keep works, only its name is being changed to Keep Notes. Google recently seeded the Google Keep app integration to Docs and has been pushing out timely new features and updates for the app as well. Now, the company is reportedly renaming the note-taking app to Keep Notes. It is neither a wildly imaginative name nor pressing news but it is out-of-the-blue, the company has decided to rebrand the app. The new name is yet to show up for the app on the Google Play Store and the same is true for its web version and the Google Docs integration. As per Android Police, there are no modifications or additions to the features of the app as it works the same but in case one can’t wait to get the rebranded version, its latest APK with the new name is available for download via APK Mirror. 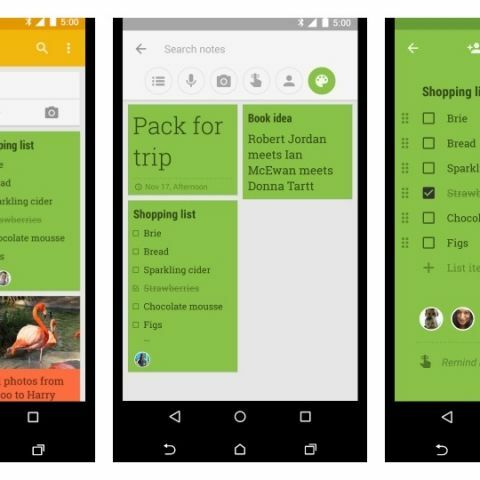 Google Keep is a fairly light-weight and feature rich app by the company. One can create a To-Do lists, label their notes, colour code them and more with the app. As mentioned earlier, Google recently integrated the quick-access panel with Google Keep, Tasks and Calendar with Docs. The panel was first rolled out for Gmail and the new feature enables users to directly access the three services without opening separate tabs. Additionally, the new side panel is now also available for Google Calendar and same as Gmail, the side panel stays minimised until a user clicks on the Tasks or Keep icon. Speaking of Gmail, its Android version now offers an option to unsend an email. The feature was earlier restricted to the email client’s Web version, but with the updated 8.7 version of its Android app, users will be able to undo a sent message. After sending an email, a notification will pop up at the bottom of the screen with “Sent” on the left corner and “Undo” on the right. This notification is displayed on the screen for a few seconds and tapping on the “Undo” option will stop the email from being sent and return you to the draft page. Gmail on on iOS and Android will also be soon updated with a ‘Confidential Mode’. Mails sent under Confidential mode expire after a set amount of time and recipients are also not allowed to forward, copy, print or download them. However, one can still capture screenshots of the mail to get around the restrictions. Additionally, recipients who have malicious programs installed on their computer may still be able to copy or download the sent messages or attachments. You can learn more about the feature here. How Do I Keep My Laptop\'s Battery In Good Health? Is it safe to keep my CPU OCed all the time? Even if it\'s only about 0.20Ghz to 0.40Ghz boost only?